In addition to working on the technology plan for my school district, I’ve also been assisting a not-for-profit trying to get strategic about technology. The struggles are instructive, but looking across these two separate instances as well as the previous organizations I’ve assisted, I’m realizing that there are some common barriers. The obvious one is time. The old saying about alligators and draining the swamp is too true, and it’s only getting worse. Despite an economic stimulus package for the US and other countries, and (finally) a budget in my own state, things are not likely to get better soon. Even if companies could hire back everyone they’ve laid off, the transition time would be significant. It’s hard to sit back and reflect when you’re tackling more work with less resources. Yet, we must. The second part is more problematic. Strategic thinking isn’t easy or obvious, at least to all. For some it’s probably in their nature, but I reckon for most it takes a breadth of experience and an ability to abstract from that experience to take a broader perspective. Abstraction, I know from my PhD research on analogy, isn’t well done without support. Aligning that perspective with organizational goals simultaneously adds to the task. Doing it keeping both short- and long-term values, for several different layers of stakeholders, and you’re talking some serious cognitive overhead. We do need to take the time to be strategic. As I was just explaining on a call, you don’t want to be taking small steps that aren’t working together towards a longer-term goal. If you’re investing in X, and Y, and Z, and each one doesn’t build on each other, you’re missing an opportunity. If you’ve alternatives A & B, and A seems more expedient, if you haven’t looked to the future you might miss that B is a better long term investment. If you don’t evaluate what else is going on, and leverage those initiatives because you’re just meeting your immediate needs, you’re not making the best investment for the organization, and putting yourself at risk. You need to find a way to address the strategic position, at least for a percentage of your time (and that percentage goes up with your level in the organization). To cope, we use frameworks and tools to help reduce the load, and follow processes to support systematicity and thoroughness. 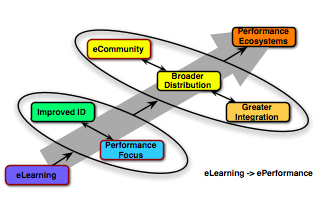 The performance ecosystem framework is one specific to use of technology to improve organizational learning, innovation, and problem-solving, but there are others. Sometimes we bring in outside expertise to help, as we may be too tightly bound to the context and an external perspective can be more objective. You can totally outsource it, to a big consulting company, but I reckon that the principle of ‘least assistance‘ holds here too. You want to bring in top thinking in a lightweight way, rather than ending up with a bunch of interns trying to tie themselves to you at the wrist and ankles. What can you do that will provide just the amount of help you need to make progress? I have found that a lightweight approach can work in engagements with clients, so I know it can be done. Regardless, however of wWhether you do it yourself, with partners, or bring in outside help, don’t abandon the forest for the trees, do take the time. You need to be strategic, so be strategic about it!